Five ways to instantly improve your website home page | KateCoote. Your website home page serves as the shop window for your business. It entices people in from the cold and gives them an idea of what it is you’re selling, or where your area of expertise lies. 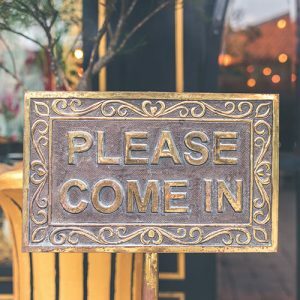 Just as store owners need to ensure their shop windows look exciting and welcoming, persuading potential clients to step over the threshold, so should your home page tempt people to explore your website and everything you offer. It’s also worth noting that one of the reasons you need to make your home page ‘work’ is because you have just a few seconds to persuade your visitors to stay on your site. If your visitors take one look at your home page (or any other landing page on your website) and decide they’d rather not go further, your bounce rate goes up. That usually means they’re not finding the information they want. It’s an undeniable truth that too many website owners want everything about their business written on the home page, (in bold and underlined)! Believe me when I say that in the case of home page design the KISS principle works. Too many competing content elements, (such as icons, banners, images, logos, titles, menus, fonts, dropdowns, social plugins, search boxes and the dreaded pop-up! ), can have a detrimental impact on the user experience. They don’t know where to look, and they certainly don’t know where to go next. If you give your visitors too many options, they won’t choose any of them. One of the biggest misconceptions in digital marketing is that your website is about your business. It’s not. It’s about how your company supports your prospective clients. So your value proposition needs to be centre stage right from the start. It’s important to use images that reflect your brand, but also ally with your messaging. Not every business has the funds to invest in professional photography, and that means that you might need to use the stock imagery. The trouble with stock imagery is that they often look, well… err… stocky! A couple of sites I use that step away from the usual, ‘Businessman pointing to arrow graph for corporate future growth plan‘ model, are Unsplash and Death to the Stock Photo. Whichever, image you select be sure it’s been optimised for faster loading. The longer image load times, the more likely it is that your visitors will get bored and move on! Be sure to incorporate elements of trust on your home page. If you’re using testimonials be sure to include a profile photo and the full name and role of the person that supplied you with the review. Nobody believes the ones that are written by Mrs. F of Dartmouth! Remember you can also use third party sites like TripAdvisor, Check A Trade or Trust Pilot. Leave your potential clients with no doubt as to what their next steps should be. Make your Calls to Action clear, clickable buttons. At KateCoote. we review, develop and design websites so that they do what they are supposed to. Convert visitors into clients and customers. If you’d like to talk to us about web design, give us a call. Businesses who blog receive 97% more links to their website. Think you have nothing to write about? Subscribe to my newsletter and let me send you 10 Top Tips to Inspire your Creativity. You're subscribing to the KateCoote. newsletter. We won't spam you, but we will send you some juicy titbits that will help you market your business online. You can also unsubscribe anytime, but we don't think you'll want to!